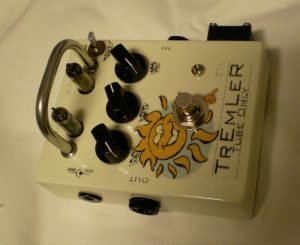 Tremler is a tremolo/boost pedal. Equipped with two 6021:s. The circuit is based on Fenders Vibro-Champ. For the time being it’s running at 2.5-6Hz in the tremolo. 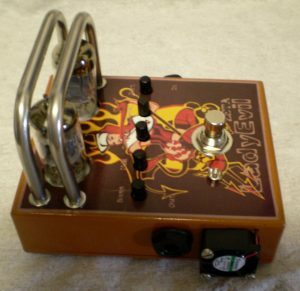 Lady Evil is an overdrivepedal equipped with two 12AX7:s. The circuit was from the beginning based on Mesa Boogies Bottle Rocket, but has been rebuilt for a more tight bottom and a focused sound. It’s powered by with an external 12VDC adapter, which is internally converted to 250VDC.